The Jan. 26, 2016, event at the Buehler Alumni Center featured a talk by Nasrin Rahimieh, a professor of humanities at UC Irvine and past president of the International Society for Iranian Studies. 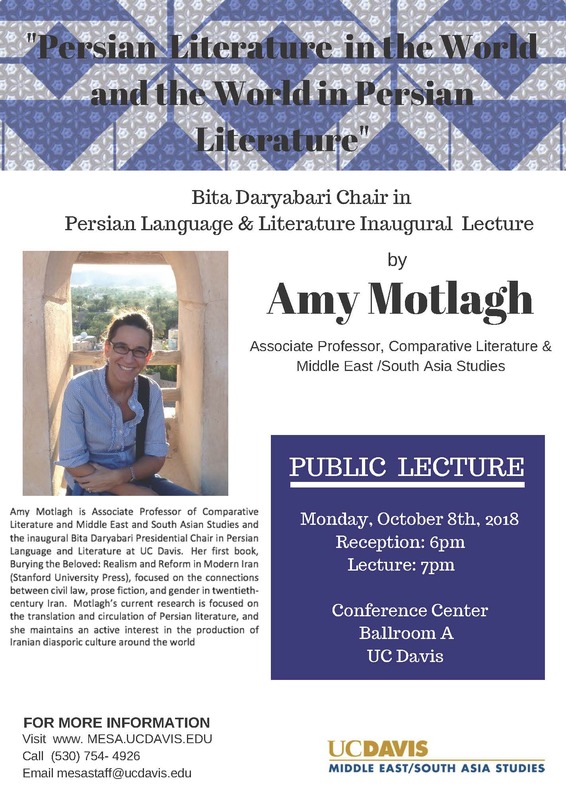 The lecture and a reception honored Bita Daryabari, a Silicon Valley philanthropist and humanitarian whose $1.5 million gift established a new Bita Daryabari Presidential Chair in Persian Language and Literature at UC Davis. Anthropologist Suad Joseph, founder of the Middle East/South Asia Studies Program, won the 2014 UC Davis Prize for Undergraduate Teaching and Scholarly Achievement. In her classroom, she propagates students in much the same way as her white Kadota figs and summer savory — urging her students to flourish by reading voluminous texts, coaxing them to look at each situation through a different lens, and teaching them what it means to be "human," her students say. Read more about her selection for the UC Davis teaching prize. Trivedi is shown in photo, far right, along with Sacramento Mayor Darrell Steinberg (J.D., ’84) and UC Davis Professors Sudipta Sen (history) and Smriti Srinivas (anthropology and director of ME/SA) at the opening of the photo exhibition. The digital archive, launched in fall 2016, seeks to share the stories and contributions to California of pioneering Punjabi Americans and their descendants through more than 700 video interviews, speeches, diaries, articles, and photographs. The history and ongoing vibrancy of Yuba City’s Punjabi American community — one of the largest rural South Asian communities outside India — is celebrated with the launch of the Pioneering Punjabis Digital Archive Project at UC Davis. The grants are designed to support the ideas of UC Davis students, faculty, and staff that promote and enhance diversity and inclusion at the University. Erum A. Syed, Chief Administrative Officer of the ME/SA Studies Program, has been awarded a $5,000 Diversity and Innovation Grant. The grants are designed to support the ideas of UC Davis students, faculty, and staff that promote and enhance diversity and inclusion at the University. Only 28% of the grant proposals submitted were selected, with preference given to those that aim to act upon, inform, or otherwise support the goals of the forthcoming UC Davis Strategic Plan for Diversity and Inclusion. Syed’s project is titled “Diversity Dialogue Series: The Muslim American Experience” which will consist of a series of three events in the 2017-18 academic year. On Sunday, June 18th, ME/SA Graduation was held to celebrate some of our graduating students from the UC Davis ME/SA community. Professor Sudipta Sen served as the faculty keynote, sharing his wishes for the group of graduates. Each student also shared their thoughts upon graduating, many giving thanks to the ME/SA community for providing them cultural support during their time at UC Davis. The Middle East/South Asia Studies program is excited to kick off 2017-2018 with events celebrating the diversity of South Asia. Check out the College of Letters and Science's feature on this year's upcoming events here! All undergraduate students working on the middle east and/or south Asia topics and taking courses related to the middle east or south Asia qualify for the award. Qualification can be met by doing a 92 or 192, 98 or 198, 99 or 199 or 194H with a professor on a ME/SA related topic - or by taking a course on the middle east or south Asia or their diaspora. 3. Why is your answer a plausible answer to the question? 4. Why should we answer this question? 4. Letter of recommendation: One letter from a professor who will be mentoring the student on the research. The student are to sign up for a 92 or 192, 98 or 198, 99 or 199, 194H or a course on the Middle East or South Asia with the understanding that the faculty member commits to mentoring the student to carry out the research. Funds may be spent on research related costs, with the approval of the faculty mentor. 5. Results: The awardees will be expected to present their research results in Spring 2019 in the ME/SA Student Symposium and the UCD Undergraduate Research Conference. 6. Applications must be submitted before 5pm on Wednesday, November 20, 2018. Results will be announced by December, 2018. On Saturday, October 27, eleven people were killed at the Tree of Life/Or L'Simcha synagogue in Pittsburgh. The mass murder happened during a bris, a ceremony to welcome an infant into the Jewish community. It was the deadliest antisemitic attack in the history of the United States. The program in Middle East/South Asia studies at UC Davis stands in grief with the Jewish communities in Pittsburgh and across the country. We express our deepest condolences to the families of the victims, many of whom were elders, and those who were injured, including the first responders trying to stop the shooter. We also recognize and stand in empathy with those in our community whose safety and dignity is under threat. At a time when the forces of antisemitism have been emboldened and hate crimes against marginalized groups are on the rise, we as scholars of the Middle East and South Asia note the deep and deadly links between white supremacy and nativism, and the resurgence of intolerance and vitriol towards Jews, Muslims, Sikhs and members of many other ethnic and religious minorities. The symbol of the “Tree of Life,” in Jewish culture, has long represented the pursuit of knowledge. The ME/SA program at UC Davis is dedicated to pursuing and disseminating knowledge of the diverse cultures of the Middle East and South Asia in order to dispel ignorance and prejudice and clear the path toward understanding and truth. In our grief and in our condemnation of xenophobia and white supremacist violence, we recommit ourselves to this work. For years, Iranian academics, writers, and scholars have equated national develop- ment and progress with the reform of men’s sexual behavior. Modern intellectuals repudiated native sexuality in Iran, just as their European counterparts in France and Germany did, arguing that transforming male identity was essential to the recovery of the nation. DeSouza offers an alternate narrative of modern Iranian masculinity as an attempt to redraw social hierarchies among men. Moving beyond rigid portrayals of Islamic pa- triarchy and female oppression, she analyzes debates about manhood and maleness in early twentieth-century Iran, particularly around questions of race and sexuality. DeSouza presents the larger implications of Pahlavi hegemonic masculinity in creating racialized male subjects and “productive” sexualities. In addition, she explores a cross- pollination with Europe, identifying how the “East” shaped visions of European male identity.